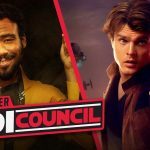 The post Collider Jedi Council: ‘Solo’ Deleted Scenes Give Us More Lando and Han on Trial appeared first on Star Wars News Net. Collider Jedi Council! ‘Rogue One’ Character Posters, ‘The Force Awakens’ Commentary and More! Collider Jedi Council! Donald Glover Talks Playing Lando Calrissian, John Boyega’s Twitter Stir And More! Collider Jedi Council: Star Wars Episode IX – Will Colin Trevorrow Remain Director and More?